Stamford, Uffington House, collection of Montague Peregrine Albemarle Bertie, 12th Earl of Lindsey (1861-1938); by descent to his daughter, Muriel. Collection of Lady Muriel Barclay-Harvey (d. 1981). Her sale, London, Sotheby’s, June 11, 1947, lot 13: “NICOLAS LANCRET. 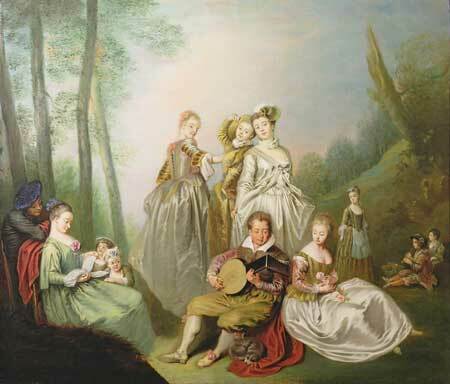 A Pastoral Scene: in a Park Landscape, two young women, in pink and blue dresses, seated, and a young flautist standing behind them, left; a young man in white dress and a crimson cape is dancing, right; tall trees behind the group on the left, and a river spanned by a stone bridge in the background 34in. by 41in.” Sold for £620 to P. Littler according to Sotheby’s price list. Saarbrücken, sale, Dawo Auktionen, October 31, 2012, lot 3: Follower of Jean Antoine Watteau, Flötenspiel und Tanz im Park, oil on canvas, 87 x 105 cm. Estimate: €1800. Bought in. Despite the attempted attributions in the past—to Lancret, Mercier, probably others, perhaps even Watteau—the picture is only a pastiche, one that draws upon several well-known Watteau compositions. Benoît Audran after Watteau, L’Enchanteur (detail), engraving. 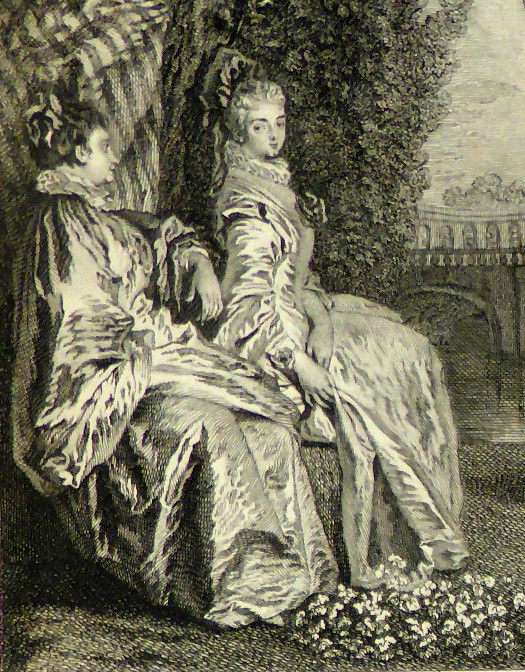 The two women seated in the foreground of the painting copy figures in Audran’s engraving after Watteau’s L’Enchanteur. 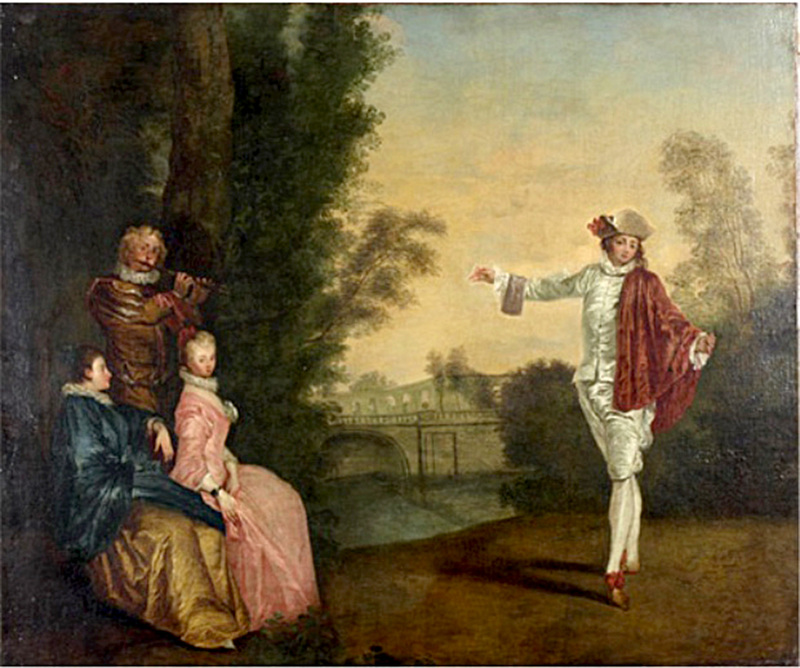 In addition, the distant bridge and arcade are based on the architectural elements in the background of Watteau’s composition. 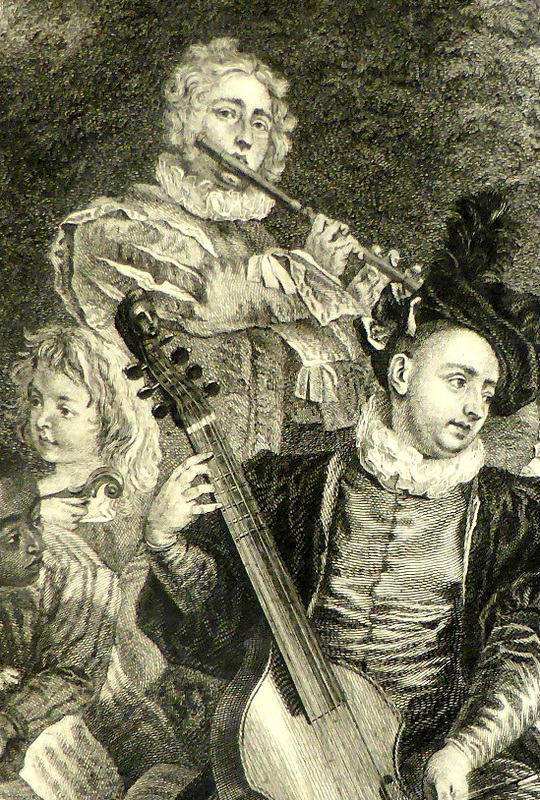 Benoît Audran after Watteau, Le Concert champêtre (detail), engraving. 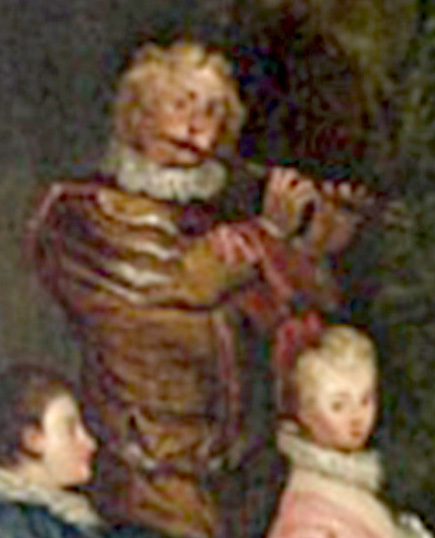 The flutist standing behind the women is borrowed from Audran’s engraving after Le Concert champêtre, where he likewise poses behind other figures and thus appears only in half length. 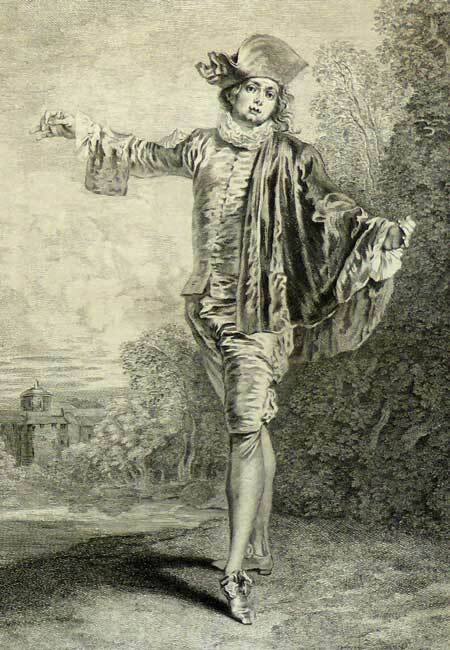 Gérard Scotin after Watteau, L’Indifférent, engraving. 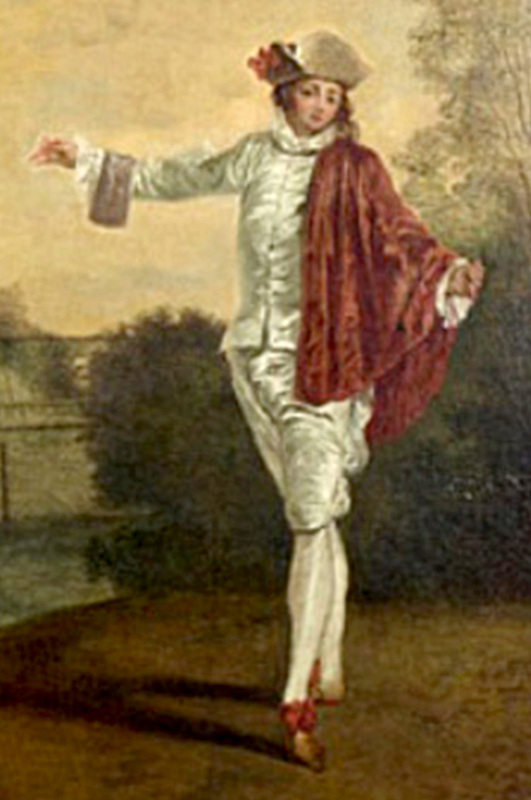 The gracefully strutting dancer at the right side of the painting copies Scotin’s engraving after Watteau’s L’Indifférent. This pastiche’s reliance on engravings from the Jullienne Oeuvre gravé reveals that it must have been executed after 1730, by which time all three engravings were available. Anonymous artist, Scene with Commedia dell’Arte Characters, oil on canvas, 63.5 x 76.2 cm. Wilton, Wilton House, Earl of Pembroke collection. The pasticheur responsible for this painting cannot be identified by name. Nonetheless, there is a resemblance between this work and other pastiches after Watteau, such as the fête galante in the collection of the Earl of Pembroke. Moreover, these paintings share a provenance that can be traced to England, in some instances even to the early eighteenth century. 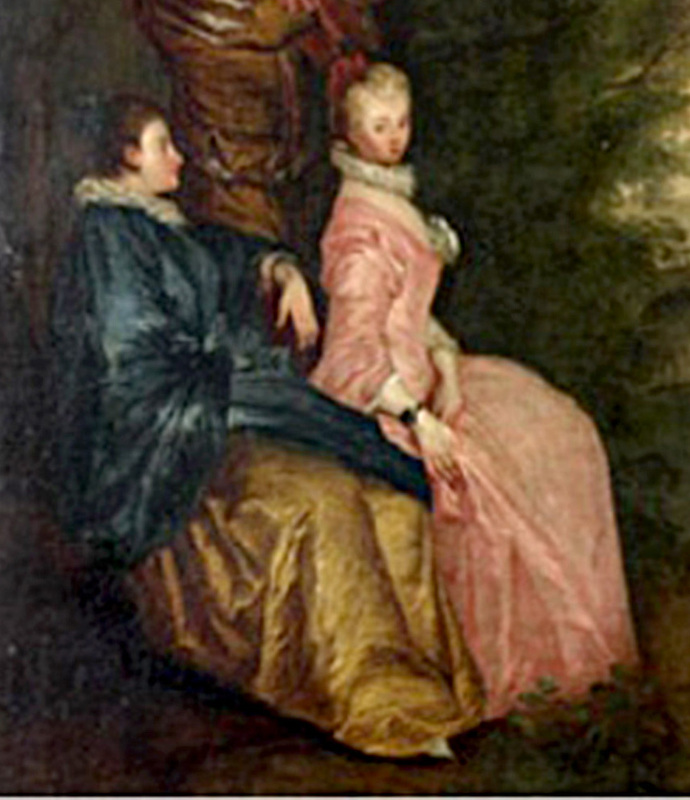 While it is generally difficult to assign the work of Watteau’s pasticheurs to specific artists, it is possible that this one was English, but not Philippe Mercier—to whom such paintings have occasionally been attributed. When this picture was sold in 1947, it was accompanied by a pendant, likewise attributed to Lancret, of the same size, and depicting a comparable fête galante. The pendants were separated and sold separately to different buyers.